Click the button below to add the Sinol Allergy Relief Homeopathic Nasal Spray with Capsaicin (15 ml) to your wish list. Sinol M All Natural Nasal Spray is a clinically proven, doctor recommended all natural sinus remedy guaranteed to deliver relief from sinus congestion, allergy symptoms, sinus pressure, headaches, pain and suffering within minutes. Sinol is the best, fastest working, most effective over the counter Sinus Relief Remedy on the market. This product is backed by the New York Allergy & Sinus Center. Along with allergist from around the globe. Finally, a Natural Nasal Spray without Antihistamines or Decongestants! And It Really Works!!! If you suffer from common seasonal symptoms including tender sinuses, congestion, sinus pressure, a headache that feels like it's centered around your eyes or in the front of your head, Sinol is right for you! Most people don't realize that sinusitis can also present symptoms like pain in your cheeks, your upper jaw, or even your teeth. 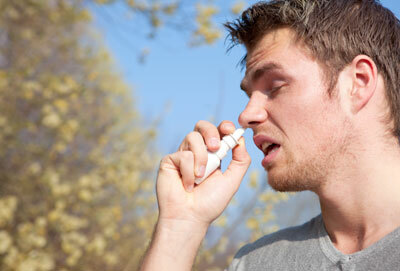 Sinol Nasal Spray will help relieve your symptoms. Anything that causes swelling in your sinuses or keeps the cilia from moving can cause sinusitis. This can result from a cold, or occur because of changes in temperature or air pressure. Sinol nasal spray is a clinically proven, doctor recommended all natural remedy guaranteed to deliver relief from congestion, pain and suffering fast! Sinol Allergy uses Capsaicin, an ingredient that comes from the pepper plant. This natural ingredient has been harnessed into a nasal spray to bring instant relief and pain control. The capsaicin in Sinol desensitizes the mucous membranes in the nose which make them less irritated by airborne allergens, while nasal congestion is broken up with sea salts and eucalyptus cleanses and moisturizes the nose. This combination helps to relieve allergies and congestion fast and helps to prevent allergy triggers while keeping your nasal passages moist, clean and bacteria free, making it the most powerful, all natural allergy remedy on the market today.